CarPlan T-Cut Color Fast Scratch Remover - White 150g. The Next Generation of T-cut. This innovative product combines T-cut’s unique scratch removing technology and adds colour to paintwork in one easy application. The patented formula is enhanced with nanotechnology, which makes it easier to remove scratches, scuffs and blemishes. The coloured pigments blend with all shades of black paintwork, cleaning and removing oxidation, creating a flawless colour-matched finish. A surface scratch is determined by feeling no obstruction when passing a fingernail over the mark. If an obstruction is noticed, it will be deeper then a surface scratch and T-Cut Color Fast Scratch Remover can only help in improving the appearance of the scratch. Apply sparingly to the surface and rub in a circular motion until the scratch is removed. TIP: Apply Triplewax Car wax or T-Cut Colorfast to enhance the car bodywork. Warning: Do not use if lacquer coat is damaged. 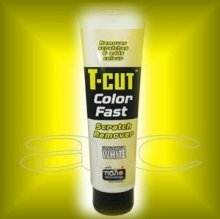 T-Cut Color Fast Scratch Remover contains abrasives. When used on cars caution should be taken not to remove excessive amounts of paint which may cause the primer to show. Avoid hard rubbing on angled surfaces e.g. the edges of wings. Do Not use on newly painted surfaces, glossy surfaces may become dull, test on a small inconspicuous area to ensure compatibility.